In the video above a Shaping Clay, Shaping Life participant from Sarah's Inn, an organization whose mission is to improve the lives of those affected by domestic violence, talks about her experience as she adds her stone to the Cairn & Cloud. The Cairn Project brings the healing light of compassion to the darkness of individual loss and pain. The project began after artist Corinne D Peterson had a vision in a dream about hanging small clay rocks in a grid. As she sculpted them in her studio, they came to represent individual traumas that were transformed by her kind attention. With a background as a psychotherapist, Peterson understood through clinical research how trauma can cause a divide in the brain, while meditation can help to heal it. The meditative process of working with clay is a powerful means to that end. Beginning in 2014, Peterson collaboratively developed workshops titled Shaping Clay, Shaping Life in order to share the power of creative meditation with a broader community. Workshop participants are asked to create two forms: a rock from stoneware clay that embodies their inner experience of pain and loss, and a small white porcelain token that represents their inner light and hope. When installed, the stoneware rocks are piled to form a memorial cairn, with the porcelain tokens of light hovering above. The light over dark becomes a collective expression of trauma and of hope. 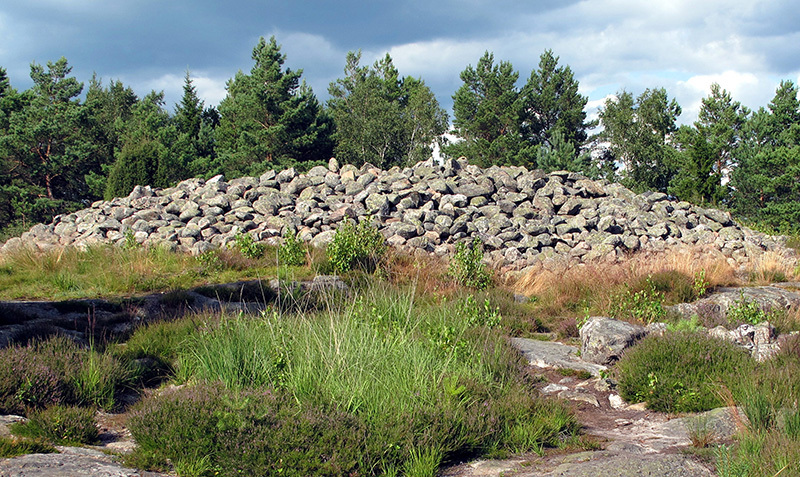 ​A cairn is a man-made heap of stones constructed as a monument or landmark. The Cairn & Cloud takes inspiration from examples of this type of stone memorial, which are found across the world and can be dated back to prehistoric times. For the installation of ceramic forms created in Shaping Clay, Shaping Life workshops, cairn stones carrying personal trauma are arranged in a circular mound on the floor, and the porcelain tokens of hope (painted with gold luster to recall Japanese kintsukuroi pottery to relate the objects to the metaphor that that which has been broken is more beautiful) are suspended above the mound. I practice art as a way to explore connections between opposing forces of nature, between light and dark, and between the conscious and the unconscious. My inspiration comes from dreams, meditation, and observation, enhanced by research into geology, mythology, and psychology. Working with clay connects me to my childhood roots of growing up on a midwestern farm. I press, pinch, and carve clay into natural forms and use rocks and other objects to create texture. Cracks, fissures, scars and pools of glaze are all part of my personal artistic vocabulary. I borrow colors from aspects of nature that I have studied since childhood, and use oxides to fill cracks with dark tones to enhance texture. I intend for each work to expose the evidence of its own past, much as a person reveals an accumulation of his or her experiences. I have been sculpting the rock form for many years. In the Marker series sculptures, I consider the mystery conveyed by ancient standing stones I have seen in England, France, and Sweden. I often use cracks or openings as a way to explore inner life as it relates to outer life. As I work on rock forms, I meditate on how elemental forces form and change them. These forces remind me of how a person’s psyche is formed and changed through traumatic experience. A shift during a seven-week residency in Sweden and Norway (2012) led me to work more slowly, and I now look to sculpting as a way to make more room for an inner dialog. This meditation on self, process, and form led the way for my most recent work to emerge in the form of the Cairn Project. For over two years I have focused primarily on building a collaborative installation, which has enabled my engagement with hundreds of community members across the city of Chicago and beyond.